Last week I shared a way to capture the various traffic sources (i.e. SEM, SEO, E-mail, etc…) so you could calculate the Bounce Rate for each of these Traffic Source types. In this post I am going to build upon this and show you another cool way you can leverage this to have what I call Cross-Visit Traffic Source Attribution. What is Cross-Visit Traffic Source Attribution? As an online marketer, one of the things I want to see is how each traffic source leads to online success. Within a visit, it is relatively easy to see which Traffic Source types lead to success. Normally this is done by capturing the various campaign elements and using SAINT Classifications to roll these up into Traffic Source types. However, what many marketers want to see is the overall mix of Traffic Source types that lead to success over several visits. For example, maybe Paid Search is always the last thing your visitors are doing before placing an order, but maybe the first thing they did was to click on an SEO keyword. I touched upon this a bit in an old blog post on Cross-Visit Participation which you can review here. If your organization has a desire to see a high-level view of which combinations of Traffic Source types lead to success, then Cross-Visit Traffic Source Attribution may be your answer. The only warning I will give about using this functionality is that it might burst the bubble of some of your co-workers who think that their Traffic Source type is the “end all, be all” of success. In my experience, many people bounce around quite a bit and the results can surprise you! When it comes to attribution, many talk about First Touch, Last Touch and All Touch, meaning which Traffic Source was the first that visitors saw in a sequence leading to success, the that visitors saw last or a list of all of the Traffic Sources that influenced the success. In SiteCatalyst, the easiest way to implement First Touch and Last Touch is to use two separate eVars. Both capture Traffic Sources, but one has Original Allocation and a long expiration (never or say 6 months), while the other eVar is set to Most Recent Allocation and expires at the Visit. However, you can also use the new Cross-Visit Traffic Sources eVar shown above to do this. Simply download the above report to Excel and then isolate the first Traffic Source or the last Traffic Source and add up the Orders (or use a Pivot Table) to see the total for each Traffic Source. Take that total (i.e. 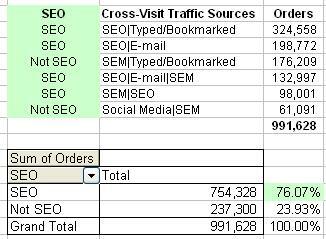 SEO Influenced Orders in this case) and divide it by the Total Orders (in this case 76.07%). This will show you how much SEO influenced Orders such that SEO was involved in a visit that ultimately led to an Order. Finally, if you want to see Cross-Visit Attribution of individual Campaign elements (Tracking Codes) instead of Traffic Sources, you can apply the same principles shown in this post and my last post. have you ever concatenated datetime with the channel on the cross participation evar? There is a lot of difference between activity 6 months ago and two touches in the same session. Would the cross-visit participation solution suggested above capture a sequence of visits originating from the same source? I’m hoping it does but I’m fearful it doesn’t. In any case I think this solution is superior to the Stacking Campaigns report as you don’t need to reclassify using SAINT. Great question! You can choose whether you want to include the same Traffic Source twice in a row. I tend to include that so I can see the full picture, but I didn’t include that in my example for simplicity sake. Thanks for highlighting this option. You mention that linear allocation on eVars only works within one visit. Can you expand on that? Are you saying that it only allocates to channels or campaigns that the user stacked within a single visit? I would have thought it would allocate across visits that way you could look at a channel report and see which participates in more stacks as compared to all channels. First and foremost thank you so much for your blog, I have to say I have been reading you religiously. I have been working in Searhc marketing for a while but I recently started using site catalyst and search centre instead of Google analytics. I have to say I am used to the way google set up things and I need a bit of help for something that might seem really simple to you. Thanks a lot for your time and great advice! Thanks Adam, A really useful post… I’m in agreement that linear attribution should come out of the box as it does with some of the other Web Analytic’s Tools. 2.Adjusting the orders and revenue for each line by dividing by the stack length. 3.And finally, summing the contribution of each channel in the same way as Adam describes above (but using the adjusted orders and revenue columns you just created). 4. This should give you a linear attribution figure. To confirm… you may need to change the “>” for a “|” or whatever delimiter you are using in your stacking report. What happens if a site uses source parameters on internal links that point to other sections of a site? Does the cross-visit participation plugin record multiple tracking codes over a single session, or would it only track one per visit? Thanks, that makes sense. So it will record multiple tracking code changes that happen in the same session? With a tool like GA, for example, even though you can see multiple touchpoint attribution with the new Multi-Channel Funnels feature, it doesn’t work if you define multiple sources on a single visit because it will attribute the entire visit to the last defined source. So it works for multiple visits, but not a single visit with multiple sources.